Making a mouthguard on one jaw, using a model(s) prepared from an impression(s) of the teeth taken by or under the supervision of the clinician (that’s the dentist) and subsequently inserted by the dentist. This is a GST item which means GST is added. Why? I don’t know, but we view this as preventive treatment! 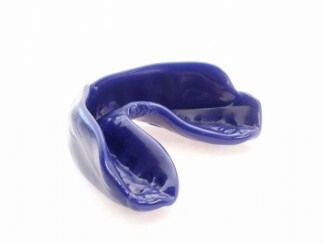 A mouth guard custom made to a person’s mouth is far, far better than a self-moulded plastic shape, made in hot water. It makes you look like you mean business! 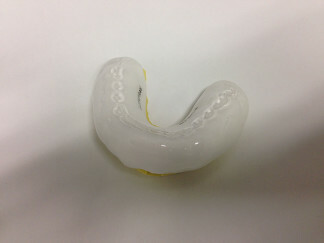 The cost of a properly made mouthguard is tiny compared to the damage and injury that it prevents. Remember that some injuries may never be corrected to the way your body was. This includes loss of teeth and bone and fractures that misalign the bite and joints. Teeth and bone fragments can piece the lips and cheek and may cause scarring and the list goes on. The sport that really benefits from a mouthguard is hockey; that hockey stick certainly messes with the teeth big time! The number of times we have had to resurrect a player’s mouth is incredible. It’s not worth it. Wear it! Making a bi-maxillary (i.e. 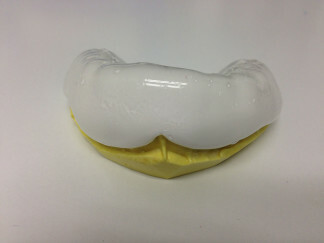 on both jaws) mouthguard using models prepared from an impressions of the teeth taken by or under the supervision of the clinician and subsequently inserted. This is often used for high impact sport such as boxing. GST is also added onto to this item. Yes it’s silly! Always rinse in cold water and place the mouth guard back on the model to prevent distortion. If you use hot water it can distort. The appliance can be cleaned gently with a tooth brush and tooth paste on the teeth facing surface. If the mouth guard becomes ill-fitting, get the dentist to check if it as it can be modified to make it fit better. If it is poorly fitting it would best to replace it otherwise it won’t protect you properly.